book with 192 pages, incl. audio-CD with 74:42 min, DVD with 81.37min. Peter Noever (preface), Howard Rheingold, Bruce Sterling, Gabriele Horn, Vitus H.Weh, Didi Neidhart, Peter Weibel, Hans Diebner, Christoph Tannert, David Hudson, Terence McKenna, Elisabeth Zimmermann, Doug Millison, Timothy Leary, Elisa Rose, STR, u. a. 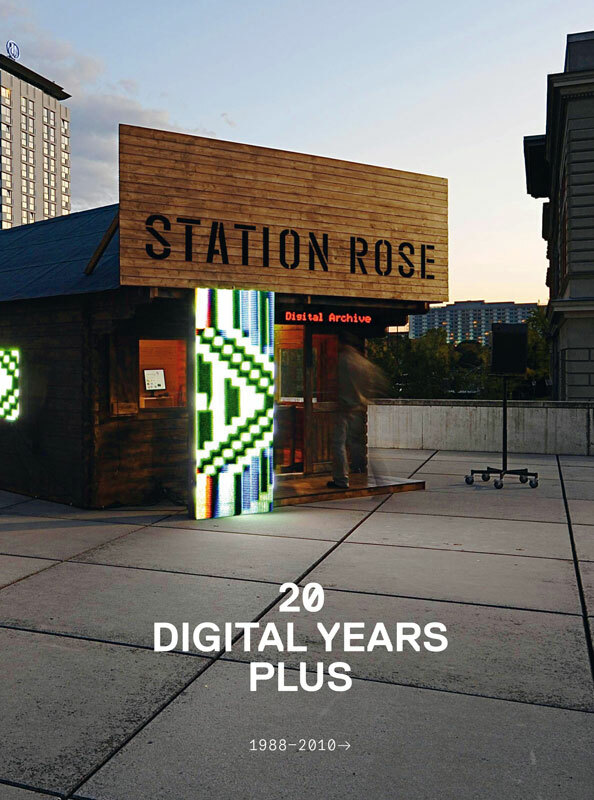 Station Rose, that is Elisa Rose and Gary Danner, summarises 20 Digital Years and at the same time delivers a current description of the situation with a visionary potential. As pioneers of media art, Station Rose found a language back in the early days of the Internet, for this ephemeral, fast phenomenon in a state of permanent change, coined terms and keywords such as »Cyberspace is our land«, »Nature is Cool«, "Digital Bohème", among others, who made virulent artistic and social conditions discernable, and thus comprehensible. Elisa Rose and Gary Danner are considered to be innovators and visionaries in the field of audiovisual art, electronic music, net art and audiovisual live performance.With »New Media Arte Povera«, Station Rose is reacting to the omnipresent crisis, rematerialising media art and showing textile objects and framed wall pieces. One part of the book is dedicated to the media sculpture »LogInCabin«, exhibited for three months in 2009, in the MAK - Austrian Museum of Applied Arts / Contemporary Art, Vienna.